Modified Arts is proud to present the works of longtime stable artist Jonathan Howard alongside the gallery debut of Patrick Dean Hubbell. 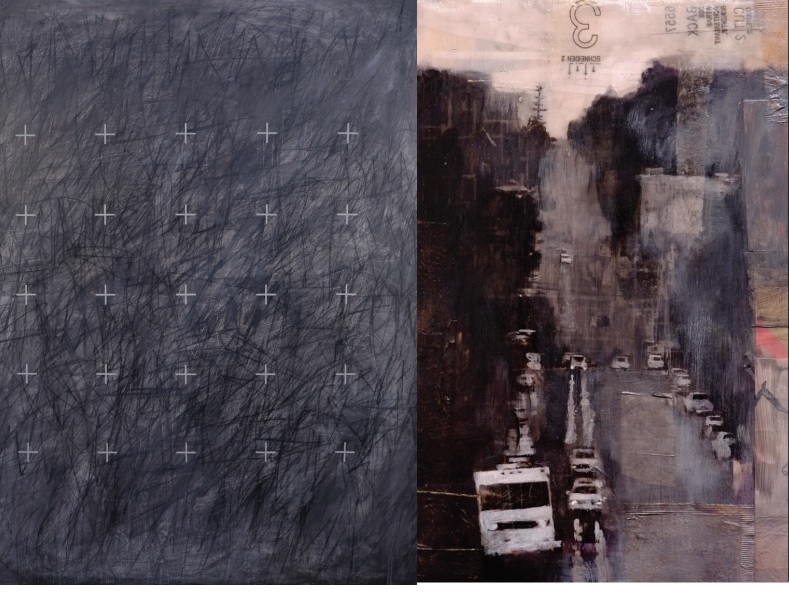 Howard’s “Haunted” works take the artist’s mastered cityscapes in a new direction, while Hubbell’s “That Which Makes Up Space” explores the intersection of identity and nature so fundamental to the artist’s practice and cultural background. Exhibiting with Modified since 2002, Jonathan Howard has experienced a full trajectory within the gallery’s walls. For his latest exhibition, building off recent group shows in Denver and Brooklyn, and responding to the increasingly paranoid US cultural moment, Howard’s latest body of work takes a distinctly darker turn. While still relying on the artist’s unique mix of acrylic, oil, drawing, and found objects, these works parse a psyche whose view of urban spaces has been colored by the nation’s recent dark turn. Based in Window Rock and an enrolled member of the Dine’ tribe of the To’ahani’ clan, Patrick Dean Hubbell’s works often first appear as abstraction, but root to a great intentionality and organization. Represented by Peters Projects in Santa Fe, Hubbell has continually explored the intersection of his Native and Contemporary identities. “That Which Makes Up Space” lays a foundation of seemingly-chaotic lines and smudges and color formations, but layers them with hyper-organized design symbols, providing centers and allowing the viewer a momentary visual experience. This interlocking order and disorder for the artist “mimics what nature provides,” also representing the alternately correlating and conflicting identities Hubbell inhabits as both Native and Contemporary in mindset and practice. These duel solo exhibitions present as muted at first glance, but invite careful consideration. With this, the viewer reveals hidden worlds in each artist’s work—both of urban landscapes colored by world events, and natural systems ordered by one’s identity.